Homepage. This page: 1965 issue of Road Test magazine featuring various American, European & Japanese cars. Ok, next up in my occasional look at motoring magazines from days of yore, when rear wheel drive ruled, and political correctness was being able to spell 'political' correctly.. This magazine hailed from across the Atlantic, back in 1965, and was published six times a year. This isn't a title I've come across before, there is no UK price printed on it so presumably it was designed to be a stateside publication only. Road Test cost fifty cents, and took pride in being 'The factual automotive guide / contains no advertising'. I've looked around online and can't find any recent references to this mag, so whether it survived with its no advertising model, is anyone's guess, but I suspect not. Nice idea though, try reading many car magazines now and you struggle to find an article about cars, amongst the advertisements for glitzy gentlemen's watches, and splendid motor insurance deals. Anyway, this particular issue was Volume One, Number Six, so quite an early copy. A close look at the cover, plonked over the US price, is a faint stamp that says SALE PRICE 6d, so perhaps a few copies did escape from the States to be sold in the UK? Splashed brightly across the cover is, surprisingly, a British car - the Rover P6 no less, in an attractive shade of pale blue. I much prefer the early grilles as on this car, compared to the plasticky offering of later P6s! It turns out that the P6 was the magazine's Road Test Award Winner, under the category of Safety and Engineering. Quite impressive for a Brit motor to get this award from an American magazine. Interestingly, winner for Outstanding Model Improvement was the Chevrolet Corvair, an automobile that a certain Ralph Nader suggested was 'Unsafe at any speed' (his book title, berating the Corvair left right and centre). 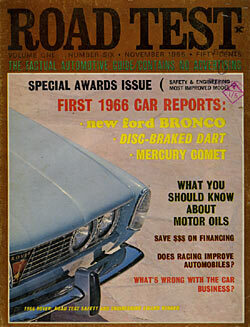 Other features given a mention on the cover are the '66 car reports for the new Ford Bronco, the disc-braked Dart, Mercury's Comet, and general articles on running and buying cars. Open the magazine and its straight into a letters page, with a few correspondents complaining that a previous road test of the Pontiac GTO were overly critical, and not completely accurate, when compared to the Oldsmobile 442 and Gran Sport. One chap in Bay City, Michigan, owned GM cars but was aware of their supposed handling limitations: ".. For some reason I have always owned and driven GM cars, and yet have to drive one that will steer properly, too much rubber and slop. I also own and drive to work (20 miles one way per day) a 1960 Sprite, and wonder why GM cannot, with all their engineering skill, even come close to the way the Sprite steers on the straightaway". Not exactly comparing apples with apples, but nice to be reminded that at one time, British sportscars were very popular in the US. The following pages refer to the Road Test awards, and the criteria used in choosing a winner. More glowing praise for the Rover 2000 (P6) can be found, such as "The 2000 is a wholly new design which has taken into consideration a maximum number of the 'roadability' criteria. It presents outstanding engineering solutions to the problems and is constructed with quality as the first premise". As mentioned, General Motors were awarded the Outstanding Model Improvement for their revised Chevy Corvair, a model that really came in for some stick when it came out, so unpredictable was its handling. However the damage was done and the Corvair's reputation would not recover from the early bad press. Pages 8 to 16 in Road Test look at the Rover in close detail, and give it a glowing report, also referring to the Gas Turbine project and showing a great photograph of the Rover-BRM Le Mans car. Next up its the turn of the revised Corvair, with an in-depth look at its altered independent rear suspension which, it seems, made a huge difference to its cornering and handling capabilities. Page 20 and its the turn of a new car, in the chunky shape of the 4wd Ford Bronco. Photos of a station wagon illustrate the article, as does a photo (well, an artists impression) of a 'Jeepified' looking Bronco, to be known as the 'roadster', with fold down screen, no roof, and cut-outs where the front doors would normally be. Power would come from an inline six of 170ci, coil springs up front, with cart leaf springs keeping the back end in some kind of order. A pickup and delivery wagon could also be chosen. For 1966 there would be a ripple of excitement in all Dodge dealerships, as the revised Dodge Dart would be coming with front disc brakes, at a time when drums all round was still very much the norm. A 'rallye' suspension setup was also an option that could be checked on the order form, alongside power steering, air con and the like. Two engines options were available, a 6 cylinder 170ci producing a wheezy 101 BHP, or the V8 273ci with a more respectable 180 BHP (or 235 BHP for the GT). Also new for '66 would be the updated Mercury Comet, another car that received a preview in Road Test magazine. To handle its larger bodywork, longer rear leaf springs were fitted, and three basic engine variants were offered (in several tunes) - the 200ci six, the 289ci V8 and the 390ci V8. The 'hot' Cyclone would have a fibreglass bonnet (hood) and bucket seats to lower the car's weight a little, keeping the 'traffic light grand prix' brigade happy. Trannie options were the manual 3 speed, a 4 speed, or the Multi-drive Merc-O-Matic, which I assume is a long way of saying Automatic. It was still bordering on heresy to drive a non-American car, but there was no denying that foreign cars were beginning to make an impact on US domestic car sales, and not just in the sportscar market, where there had long been some overseas interest. For the cost-conscious new-car buyer who didn't need a land yacht the size of New Orleans, there was the option of a little Japanese 'compact', and one such car, the Toyota Corona, fell under the Road Test tester's spotlight. Quoted as competitors are makes and models very familiar to us Europeans, such as cars from makers like Fiat, Hillman, MG (with the 1100 saloon), Opel, Renault, Ford (Cortina), Datsun and VW, which was already well established as a sensible economy car in the US market. There was obviously a market for this size of car, and it seems that no home-grown cars would feature at this level otherwise they'd have been mentioned as competitors. Quoted power was 90BHP, not far behind the 100 or so produced by the bog standard Dodge Dart, that was mentioned earlier, the latter having a much larger engine. Overall they really rated the little Corona, starting their summary with the sentence "A fire-breathing economy car that doesn't have to take a back seat in performance to any family sedan, Toyota's Corona looks like a real bargain at $1860 delivered." Praise indeed! A couple of general articles on financing the purchase of a new automobile, and looking at the problems faced by the car sales business, follow on from the Toyota article, as does another which was provided by the American Petroleum Institute, telling the reader everything they needed to know about motor oils. The article is headed up by a chap in a loud Hawaiian type shirt, dipping the lube on a transverse A series BMC engine. The final piece of reading matter in Road Test is a comparison between GM's and Ford's approaches to testing new technologies, and their significantly different views on whether 'racing improves the breed', as many manufacturer's believed. Ford were by 1965/6 well known for their support of various racing categories, whereas GM were less interested, believing that a comprehensive proving ground and strategy, were the best ways to test new road-car components, rather than on the track. The fact that success in motorsport added a certain kudos, or credibility, to a road-car maker's image, was not lost on Ford, a photograph of Jim Clark, Dan Gurney and A.J. Foyt all sat in Ford-powered single seaters at Indianapolis emphasising this.